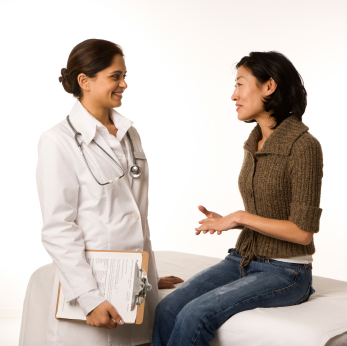 From Kevin Pho’s medical blog, KevinMD, a post archived from 2004, Pho talks about the struggles of communication between doctor and patient during the 15 minute office visit. Pho sites a NY Times article that explains that more than two decades ago, research shows that patients were interrupted 18 seconds into explaining their problem (on average) and less than 2 percent got to finish their explanations. After 20 years, not much has changed with the doctor-patient relationship. Doctors and patients still struggle with communication. Even after 40 years, patients want collaboration and respect. It is helpful to be prepared and to be empowered. Before you visit with your doctor, write down any questions that you may have. Be well prepared and organized. Keep your questions very specific. At the beginning of your visit, let your doctor know that you do have a list of very specific questions that you would like to ask. By mentioning this in the beginning of the visit, your doctor is now aware that you have questions. You are giving your doctor a “heads up” so that your doctor can accommodate your questions. Bring a trusted friend or family member with you. They can help decipher the information and take notes during the visit. You can also ask your doctor if it is okay to record the conversation. This will make it easier for you to have all the necessary information. Communicate and collaborate respectfully with your doctor. Present your questions in a clear and succinct manner. If your doctor interrupts you, or if you feel you are being rushed and you did not get time to ask your questions, calmly and politely let your doctor know that you have specific questions that you would like answered before the office visit ends. Listen carefully what your doctor is saying. If you don’t understand something, simply and politely ask your doctor to explain it in simpler terms and if it will help you to remember, take some notes. Before leaving the office, make sure you are absolutely clear about all the information you received. It is important that you understand any instructions and the treatment plan given to you. If any medications are prescribed make sure you understand them exactly. It is imperative that you trust your doctor that you feel comfortable. Trust, partnership and communication are vital for a vibrant doctor/patient relationship and good patient outcomes. What has been your experience with your visit with your doctor? Do you feel rushed? Do you get all your questions answered? Do you write your questions beforehand? Do you take notes? Share your experiences with us, we would love to hear from you. These are all good tips, and I’ve used them all. I’d like to add one–turn off your cell phone. I’ve read a lot of commentary and also talked to staff who say people take phone calls during appointments. That’s not just disruptive, it’s rude. Thanks so much for sharing your tip. Turning off your cell phone is an excellent idea! Excellent post Barbara – you’ve got to make the most of your limited time. You also need to make the most of whatever resources you have available to you – friends, family members, benefits programs…use whatever insight you can to make sure you understand what’s wrong and what to do. The problem of doctors not having enough time is not getting better any time soon. And its having a serious impact on the quality of medical care. In this age of health care management, its important that health providers and clinicians communicate well with their patients, seeing them as partners in the health management process. Any poor attitude of a clinician can interupt the perception of patients in seeing themselves as not object for treatment but persons whose health needs to improve because of provision of appropriate medication and care. Patients do have responsibilities to improving their health through their positive attitudes to get well; this attitude need to be reinforced by the health providers and clinicians. I am right now on hosptial admission in Maitama General hospital and since 5days now my doctor has not come around to talk with me about his next plan for my health management talk less of seeking my opinion on how i feel about still lying down on hospital bed. I wanted so much to talk with him on how i feel and my views about the progress of my treatment and the way forward. But that he hasn’t been around makes me even more frustrated. Considering that I am a management and development consultant, i am now feeling the urgent need for clinicians to improve on communications between them and their patients.